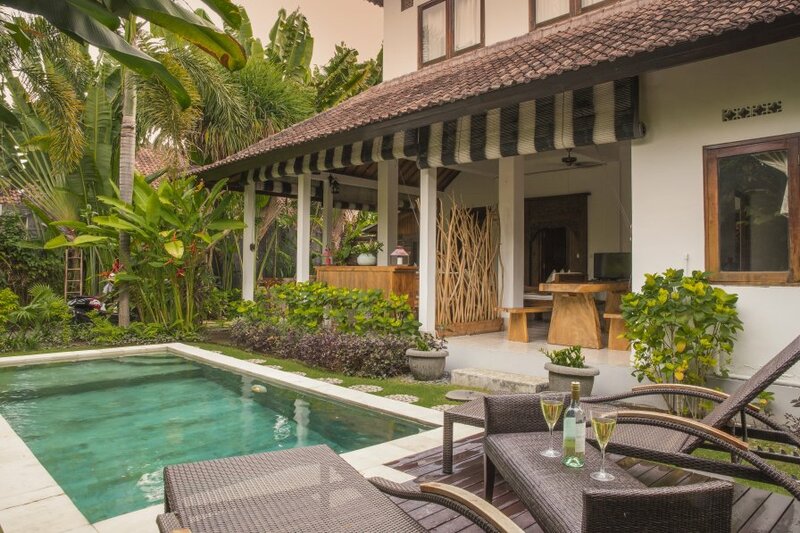 Charming Bali Style 3-bedroom villa is made with soul, tropical retreat to relax and indulge yourself. Only 200m to the Main Street, and a 15 minute walk to the beach, you can enjoy Seminyak here! Good day to you dear guest. This absolutely new villa stylish decorated in balineese style with antic wood, which I specially found to my designer project. All furniture, all details of decoration I came up with myself exclusively for this Villa as a lovely tropical garden surrounding the house. Together with the gardener to found rare flowers to create this beautiful place of rest and relaxation. A special place in my heart, this is unique decorated bathrooms, where the main part of decoration is the ancient tree. The wood, only the wood I decided for making the design of this Villa. Only wood can give a feeling of comfort and coziness. Three bedrooms with classic design, fantastic bathrooms and spacious living room waiting you. My staff will be ready to help you, when you need her help. Meet you in villa, accommodate your and explain you everything. Will be your helper during your staying in my house. Location is really great, only 100m to the Main Street, and a 10 minute walk to the beach, you can enjoy all Seminyak has to offer, while still enjoying the luxuries of a silence in your private villa. You are welcome to my remarkable house, which I build and decorated with love.